or we can recommend the installation of the slim‐profile double glazing (such as the one made by Histoglas 3-4-3 (with 3 mm glass – 4 mm airgap – 3 mm glass) or 3-6-3, 3-6-4 into the inner sash, but not with vinegary (!) silicon. The expectable Uw-value will be between 1,3–1,4 W/m2K. the inner sash is to be tackled, but not that of the outer sashes. In case the owners of multi-apartment buildings do not intend to improve the thermal insulating capacities of the windows in their flats together, but individually, one by one, the replacement of the glass in the inner sashes or their conversion is the only acceptable way of modernization. In blocks of owner-occupied flats the outer sashes of doors and windows are parts of the undivided common property, which means the agreement and approval of all the other owners is necessary for the replacement of the entire window structures. The modernizations described above leave the outer sash of the window unchanged and thus the other owners cannot claim damages as in the case of replacing whole structures. Another advantage of these solutions is that also the frame (case) remains intact, and there is no harm done to the surrounding wall surface either. The “low-e” (low emissivity) glass, a microscopically thin, virtually invisible, metal or metallic oxide layer deposited directly on the surface of one or more of the panes of glass. The low-e coating reduces the infrared radiation from a warm pane of glass to a cooler pane, thereby lowering the U-factor of the window. U‐value (or thermal transmittance co‐efficient) is a measure of how much heat will pass through one square metre of a structure when the temperature on either side of the structure differs by 1 degree Celsius. The lower the U‐value, the better is the thermal performance of a structure. The U‐value is expressed in W/m2. 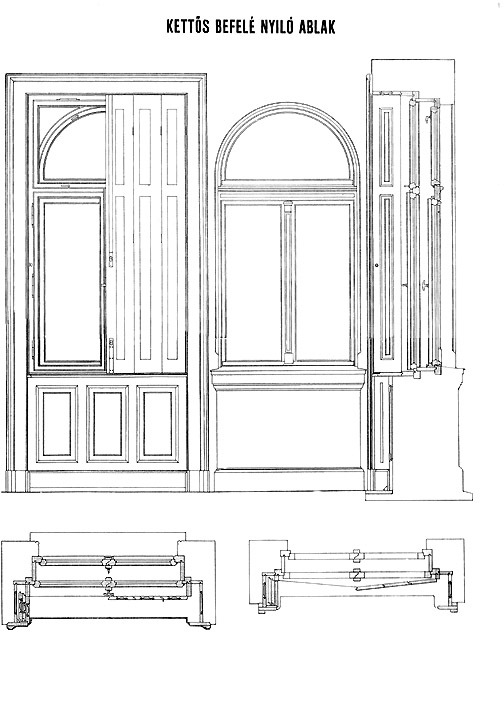 A method applicable on Neo-Classicist and Romantic-style windows. 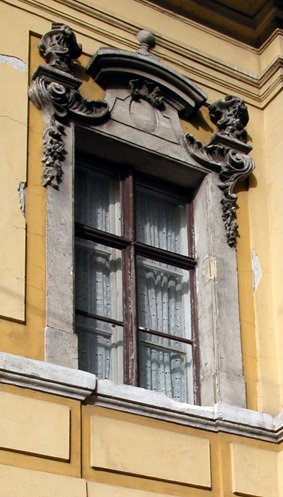 Double-layered windows opening outward-inward were typical in Hungary between 1800 and 1857. They are easy to recognize as their sashes opening outward simply close upon the frame (case) on the outer plane of the wall. Similarly to those described above, both of these solutions are suitable to increase the heat insulating value – however, the first one is more favourable if we wish to preserve the glazing bars subdividing the frame in their original forms. (The hard-coated low-e glazing of the inner sashes). 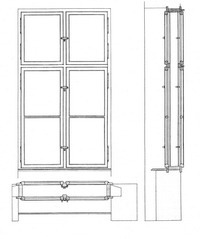 Whilst the majority of jointed box-type windows (opening inward-inward) without subdivision have a sash opening upward, or have a simple cross-division, the windows opening outward-inward are typically divided into 6-8 parts, which means it is more difficult to replace their smaller glass roundels for heat-insulating glass. The wedging of the new glazing (to the frame) is necessary for the sake of efficient closing. 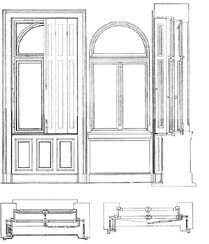 Each case needs to be considered individually, whether or not the horizontal glazing bars would bear the heat-insulating glazing and if the sash could be made rigid enough at all. As opposed to windows opening inward-inward, this type offers fine examples of heat-insulating glazing installed into the existing outer sashes. The reproduction of window sashes is also easier as their detailing is not a very complex one. Care must be taken, however, of the precise copying of the original profiles and their cross-section should not be enlarged as even a minor change is going to be easy to spot. We recommend using the original iron fittings and mountings too. More often than not we can see a variety of imitations or replicas stuck onto the glass instead of the original horizontal glazing bars on reproduced windows. This solution is not favoured due to reasons of the protection of historical and enlisted monuments and the cityscape. Applying the so-called pseudo-dividers (glazing bars) is disadvantageous not only because of aesthetical reasons but also from the point of view of technology and building physics. As thermal insulating glass is only covered by a thin wooden slat at the pseudo-divider from the outside imitating the original design form, condensing (waste) water may develop easily along the metal rod inserted between the two glass layers when the cold coming from the outside reaches it. To prevent the precipitation of moisture it is recommended to use long-span brackets of other materials – products not made of aluminium, but of materials conveying heat less, such as TREMCO Swiggle or plastic (e.g. Swiss Spacer). These materials are not widespread yet which means their application makes window-glazing rather too expensive. In wintertime the inner sash is always in touch with warmer air than the outer one, and thus heat-insulated glass structures are more advantageously applied in interior glazing also in this respect: it can compensate for the constructional deficiencies resulting from the excessive capacity of heat conduction of the long-span brackets made of aluminium. Based on several respects, we can deduce that there is no general and unambiguous solution to heat-insulating glazing for this type of windows, and in every case we advise contacting an architect with the problem. Because of the difficulties described above we also recommend preserving the simple glazing of these windows or their replacement for hard-coated low-E glass. Another concern is that the preservation of glasses not perfectly flat and made before 1830 (the spread of rolled glass) would also be welcome as they are both valuable and irreplaceable. Up until the end of the Baroque era windows remained single-layered ones and were set deep in wall openings. However, only a few of such examples have survived till now. From the 1800s on, especially in urban buildings, a sash opening outward was typically installed onto the outer plane of the window. 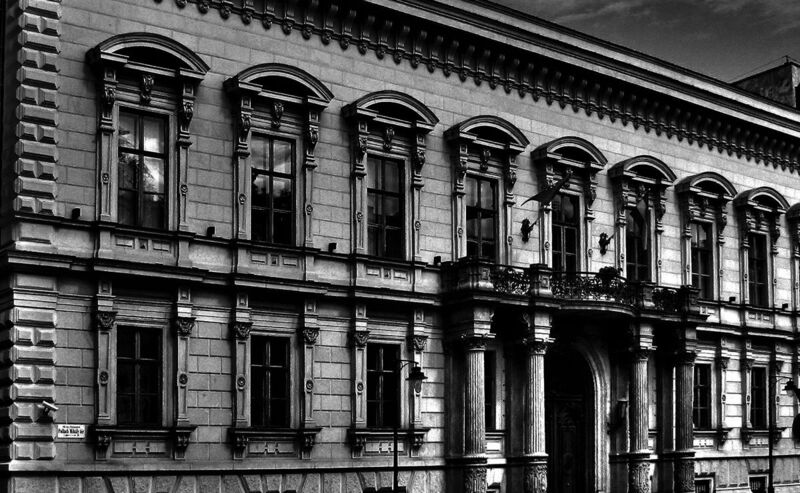 The doubling of windows typical of Neo-Classicism usually hides intact Baroque-style windows with characteristic semi-circular profiles. Later on, when deliberate and systematic renovations of protected historical buildings started this kind of outer doubling was no longer regarded an exemplary method to reveal the authentic Baroque facades, so they had an independent new sash installed instead behind the Baroque window (as it is illustrated by the photograph). Of course in both cases we recommend only to remodel and remake the less valuable sashes installed later and heave their glazings replaced, but leave the original glazing of the Baroque windows unchanged. We suggest sticking to the following principle: in case a window is a genuine rarity, Baroque-style one or even older, its material should be preserved, conserved and restored with special regard to its rarity value and its features as an artefact. Guaranteeing apropriate airing is a basic condition of healthy living spaces. According to the working principles of traditional houses the air is sucked in through the stops around windows and leaves the interior through chimneys and cracks. This kind of draught guarantees the exhange of air in the rooms without our having to take any special action or measure. In case it is not an artificial airing that guarantees the interior exchange of air, the installation of windows provides unnecessarily perfect air-insulation, which tends to produce mouldy and damp environment. This happens because vapour gets into the air when rooms are simply being used and it condenses and precipitates in lack of appropriate ventilation. This means we should not aim at having perfectly closing windows in old buildings without mechanical airing. We are to take into consideration that perfect air insulation may result in more damage and harm than the supposed loss of heat. The Uw value of a double-layered traditional window with simple glazing is approximately 2,2 W/m2K, if there are no rather too big cracks at the stops. It is important to avoid air-sucking around the windows – to phrase it in professional terms: filtration should not be excessive. Sealing with stuck rubber profileIt is recommended for interior spaces equipped with mechanical airing. 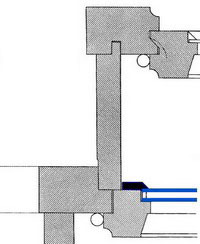 This solution typically requires slot-drilling, which is unfortunately a damaging and also irriversible method. When applying the same rubber profile it is not quite efficient with clearances placed at different distances from each other, which is especially true when the sealing strip is not flexible enough to adjust to the varying sizes. Before ordering a service like this, we should ask how many millimetres the shape of the sealing can change (and then compare it to the size of the cracks of our windows). It is well worth adjusting the windows before application, A typical mistake is the discontinuity of the sealing at the corners, as they are being lengthened right there. Moisture getting in between the two windows through the gaps results in condensation if the interior vapour content is intensive, For later reconstructions it is important to know whether the sealing can be painted over or be removed for the time of repainting. It is a short-term solution lasting a few years only, but is a DIY technique which is also cheap and simple to employ, It only takes a couple of hours to make but improves the window a lot. Before sticking one must check where the window links up, we must keep it clean of sealing or else the window shall strain when closing and being closed. This may be stuck onto the outer and inner sashes at the same time, as it does not guarantee airtight closing. It is a kind of sealing in traditional flats and spaces without mechanical ventilation. 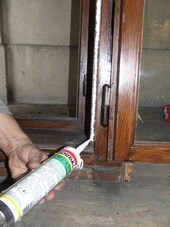 It is a cheap technique of sealing windows that anyone can do. Acryl looks similar to silicons available in DIY-stores even though they cannot be cut after drying. Acryl can be shaped with a utilitycutter blade. A continuous strip of acryl must be placed onto the inner sashes and the stop which would fit to the frame (case) and then covered with an 8 cm wide strip of a nylon bag or with a kind of thin foil separating forms and already tested that will come off the acryl easily after drying. It is important to have the entire surface of the stop of the window protected or else the case (frame) may stuck to the sash. After the acryl has dried the nylon must be removed and the excess pressed out of the stop has to be cut off. This solution is a practical and advantageous one as it takes on the shape of the counterpart form. If the window does not close well and efficiently enough after the first application, we can repeat this action as many times as needed and the result can be improved this way. It is well worth choosing a product the manufacturer of which guarantees that the flexible acryl does not harden by time and shall not break up either. An advantage of this method is that we can get a good result even if the the window is warped. Another benefit is that it can be painted over as opposed to siloplast which is also used as it is flexible and cuttable. We can also use one-component silicone pastes which have the advantage of being elastic. It is to be noted here that by improving the existing two-layered windows to such an extent the increasing heat-insulating capacities prescribed for passive houses are achievable with the window structures themselves in case vacuumed or gas-filled heat-insulating glass is installed into both the inner and the outer sash. 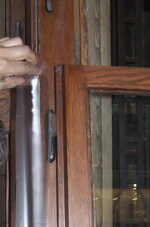 Rubber profiles guaranteeing perfect air-insulation may be installed into the stops of windows (e.g. by milling down the stops). In passive houses the artificial airing of interiors as well as the airtightness of openings is also guaranteed. The junction of the wall and the case is concealed by a ribbon to have air-free closing. It is to be noted here that the updating of windows on old buildings to such an extent is only practical if the walling itself is also heat-insulated in an efficient way. As the windows themselves make up only a small percentage of the outer bordering structure the heat-insulation of roofings, floorings and walls would be more important than those of windows. The outer and subsequent heat insulating of facades of existing ornate buildings would involve the knocking off and hiding of the members and thus cannot be considered an exemplary method to be followed. The typical width of the walls of facades is 55 cm, whereas that of partition walls is only appr. 40 cm. The airwells of urban dwelling houses tend to have 15 cm wide wallings. This is why one can spare considerable amount of heating energy by the subsequent thermal insulation of partition walls and airwells.